Earlier this week it was a great surprise to see WordPress had chosen this blog, as well as that of another Soul Food member, Anita Marie Moscoso, as their blogs of the minute. The sites were featured for twelve hours a piece, and needless to say Heather was quite proud indeed! 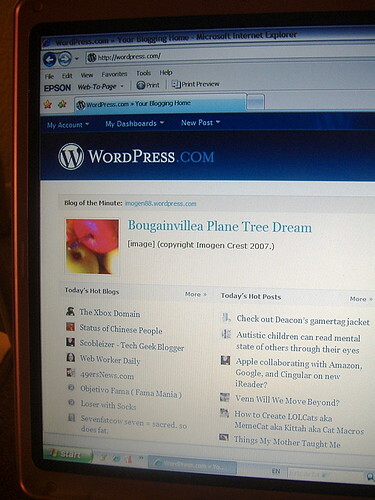 This is a huge reach for Soul Food as a whole, with WordPress in the top percent of the blogging traffic world. Viva, Soul Food Cafe! This really was sensational and the screen looks just fabulous here Monika. Well done Magoo! Thanks Heather ;-)! Haven’t heard that name Magoo for ages. Chalk this one up on the board for Soul Food. Terrific, Monika! So proud of you! This site is one of my favorites. When my soul is in turmoil and I need some of nature’s serenity and gentle words, I enter the Lemurian Hermitage and I am revived. Surely a site for sore eyes. Hooray and felicitations to Imogen and Anita Marie! Yes! Great news! (Do the dance of joy!) I’ve been on a silent retreat here for over a week and it’s wonderful. All the beautiful scenery and the thoughtful readings. Thank you, Imogen. What a wonderful piece of news for Soul Food! Actually, we are not just the blog of the minute, but blog of every minute of your life!